A very exciting find for me – Black-billed Cuckoo out at Wallkill River NWR 7/31/13. 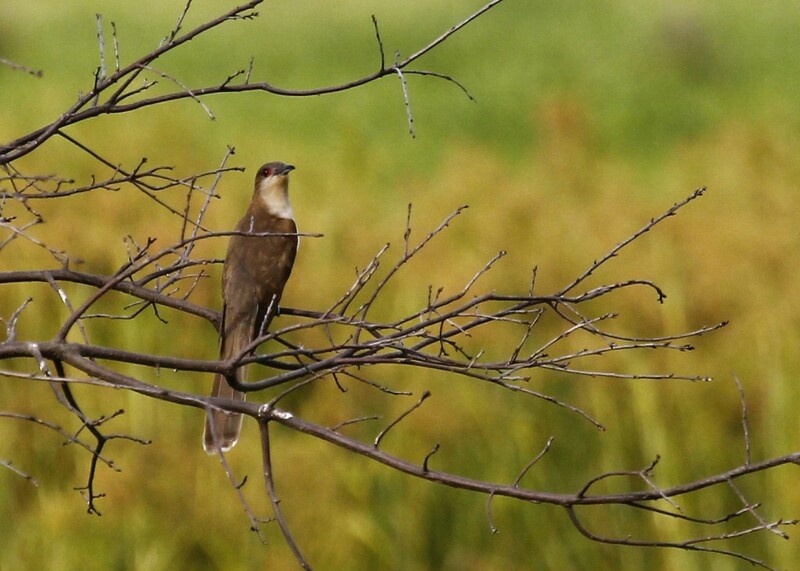 Seeing and photographing an adult BLACK-BILLED CUCKOO was definitely the highlight of my visit to Wallkill River National Wildlife Refuge after work today. It was a fabulous night for birding; the weather was perfect, there were minimal bothersome bugs, and there were plenty of birds to be seen. I walked the Liberty Loop in the counter clockwise direction and not far up the trail I found a pair of Great Egrets (of a total of four for the day). I know it is an invasive plant, but I love the purple Loosestrife in this photo. I also like the water drops falling from the tips of the egret’s toes. 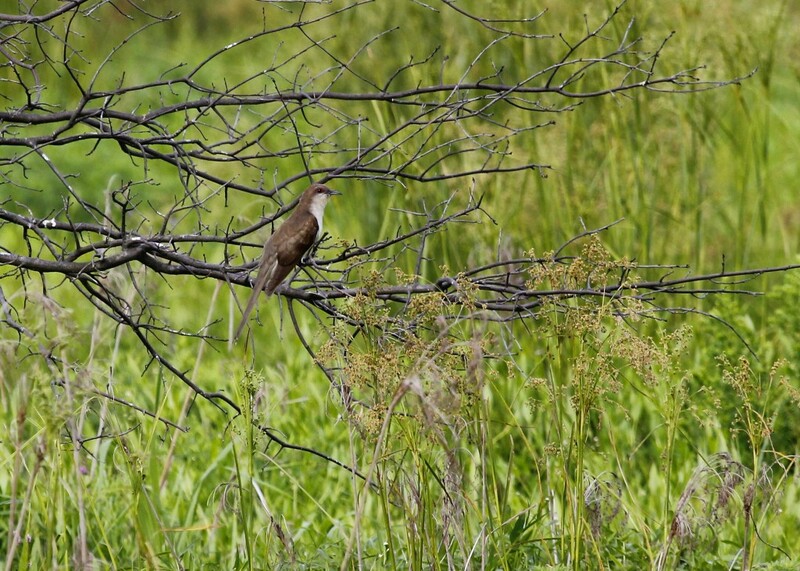 Black-billed Cuckoo at Walkill River NWR, 7/31/13. My main reason for going to the refuge was to see if any shorebirds had moved in. There was not much in the way of shorebirds, a pair of Semipalmated Sandpipers, 3 Killdeer, and 9 Least Sandpipers were all that I found. All were seen on the southernmost part of the loop. 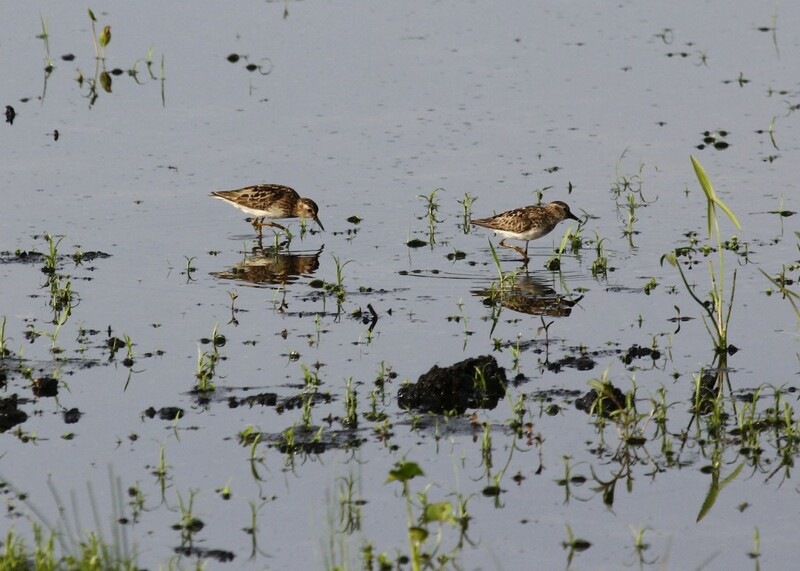 Two of the nine Least Sandpipers that I saw out at the Wallkill River NWR, 7/31/13. I totalled 39 species for the day, a couple of which are birds that I don’t often get a chance to photograph. 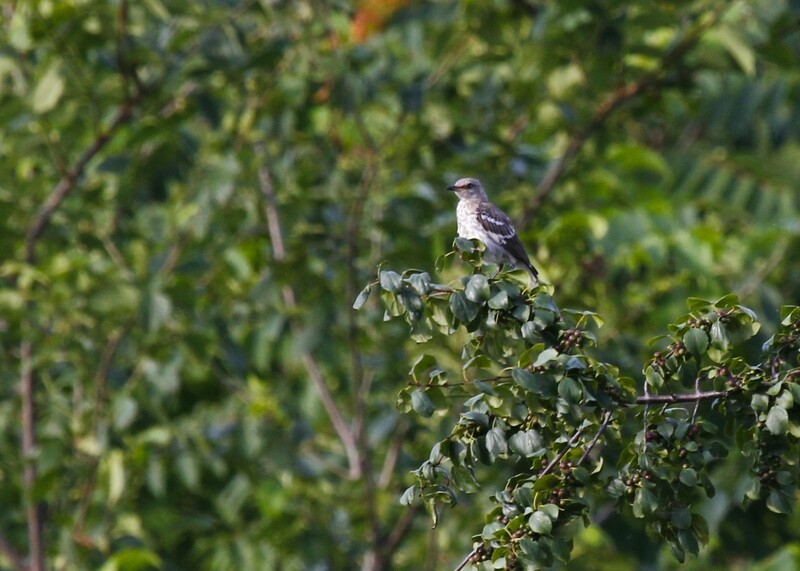 This looks like a young Northern Mockingbird to me. It was with two other mockingbirds that appeared to be adults. Wallkill River NWR 7/31/13. I love this little bird but don’t really see them very often. 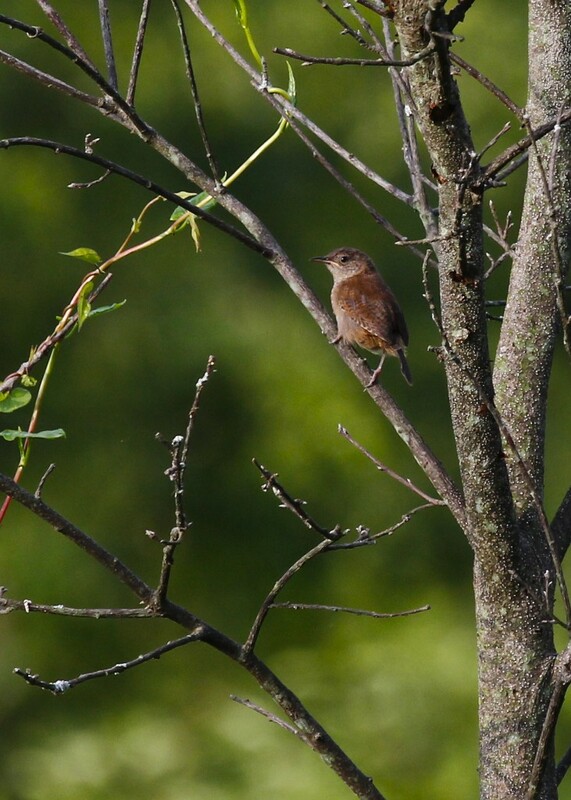 House Wren, one of two perched in the same tree at Wallkill River NWR 7/31/13. 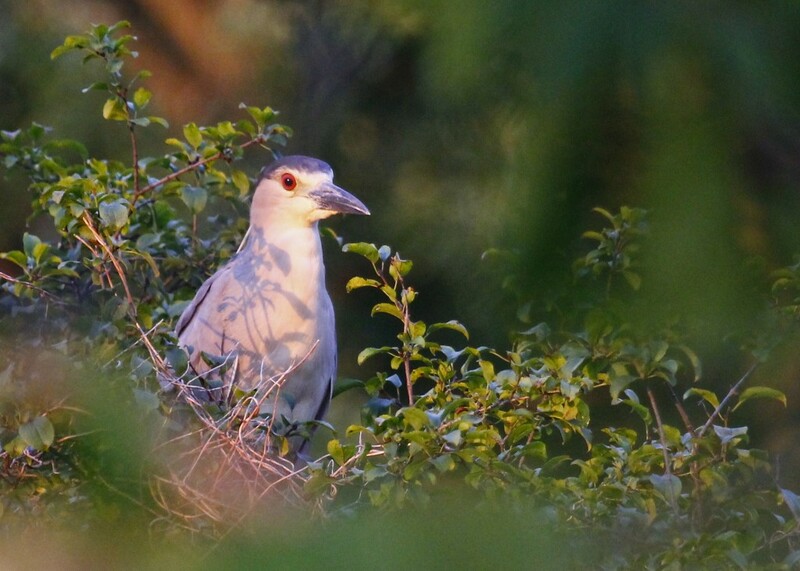 Author mattzeitPosted on July 31, 2013 Categories Orange County, Wallkill Wildlife RefugeLeave a comment on BLACK-BILLED CUCKOO! 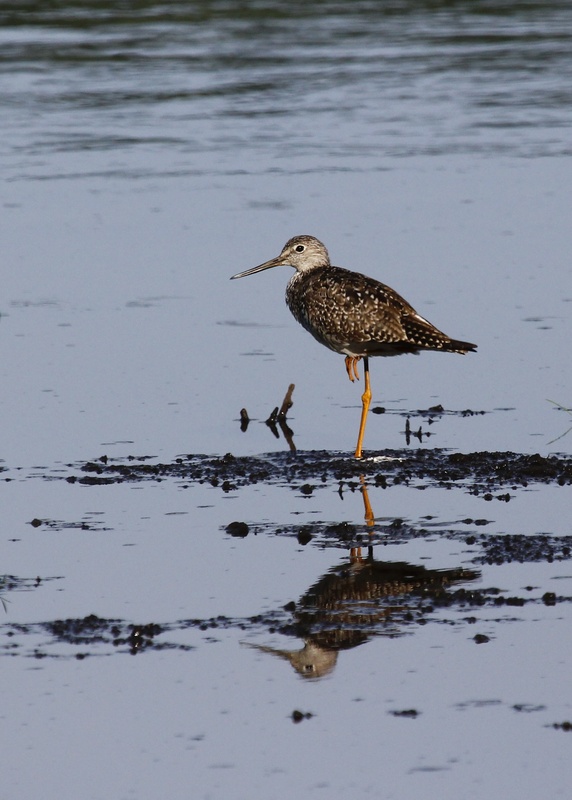 One of four Greater Yellowlegs at the refuge on 7/24/13. 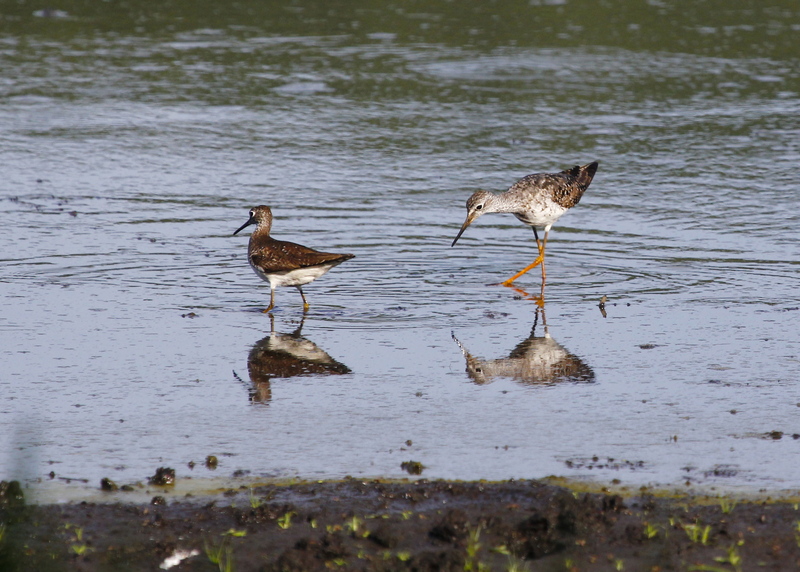 I got to see this Lesser Yellowlegs near a Greater Yellowlegs and a Solitary Sandpiper. It was really interesting to note the differences between the three. Wallkill River NWR 7/24/13. A Solitary Sandpiper and a Lesser Yellowlegs at the refuge on Wednesday 7/24/13. I don’t love this photo but I like seeing the two birds together. The morning light was really appealing, and I am really happy with the colors in this photo. 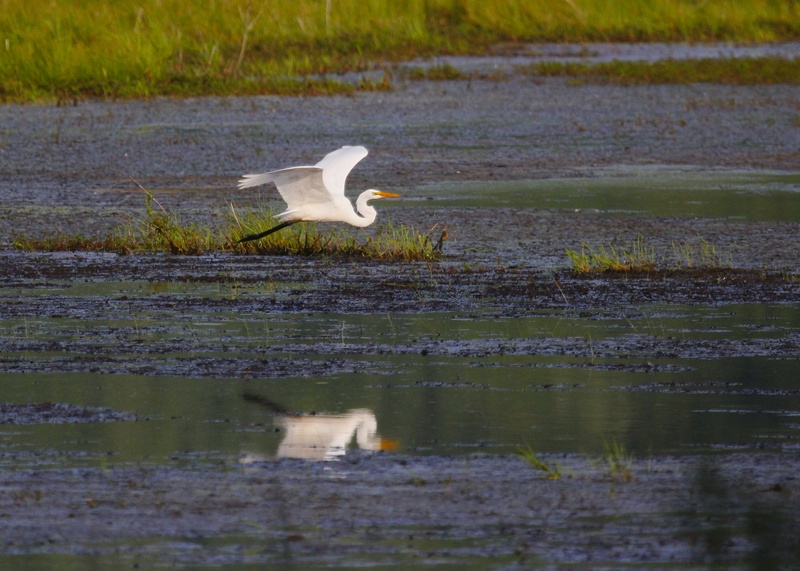 Great Egrets at Wallkill River NWR 7/27/13. 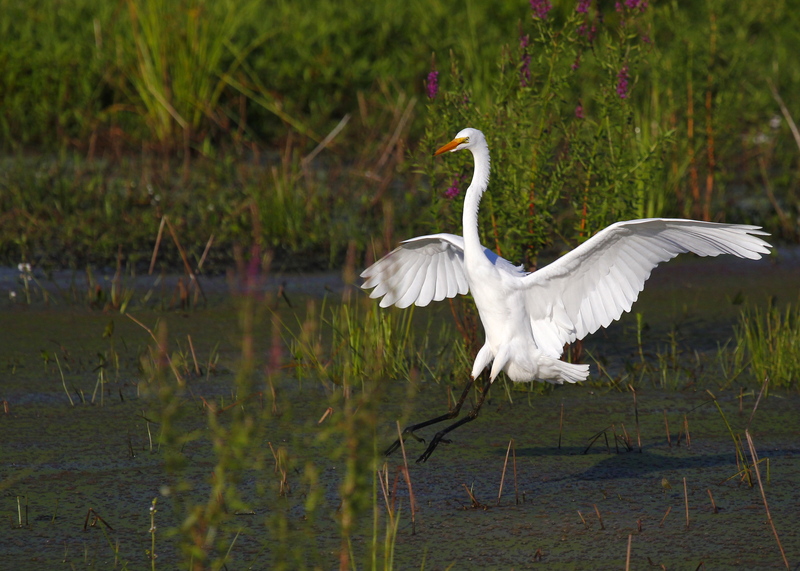 Great Egret at the refuge this morning, 7/27/13. Who’s gonna mess with this crew? Not me. 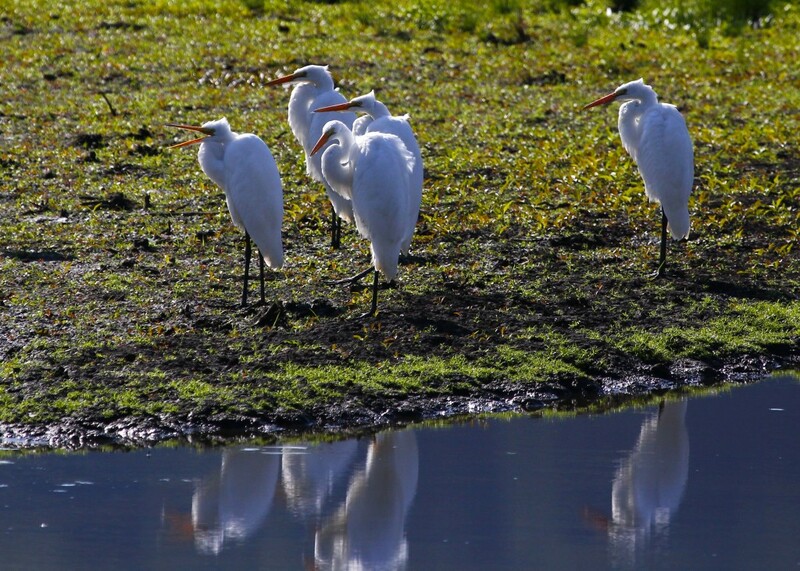 Five of six Great Egrets at Wallkill River NWR 7/27/13. 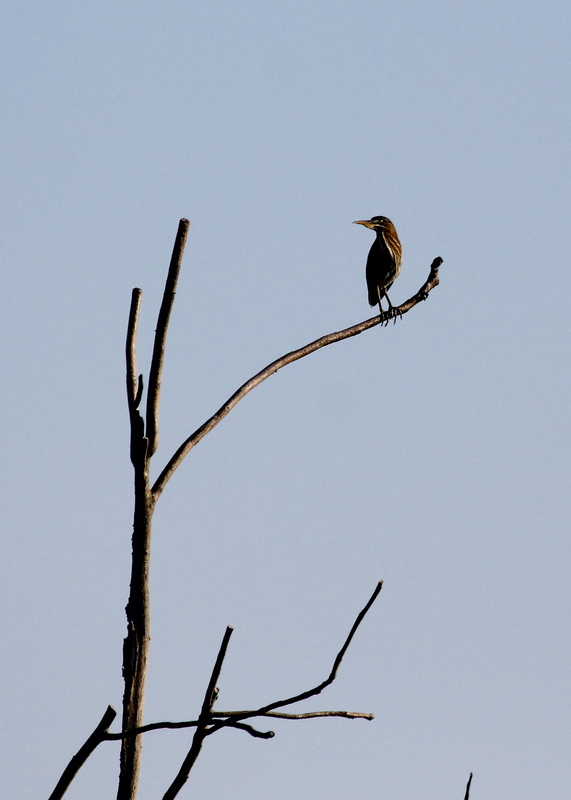 I’ve been seeing a hearing plenty of Green Herons at the refuge, but not getting close enough for any good photos. Wallkill River NWR 7/27/13. 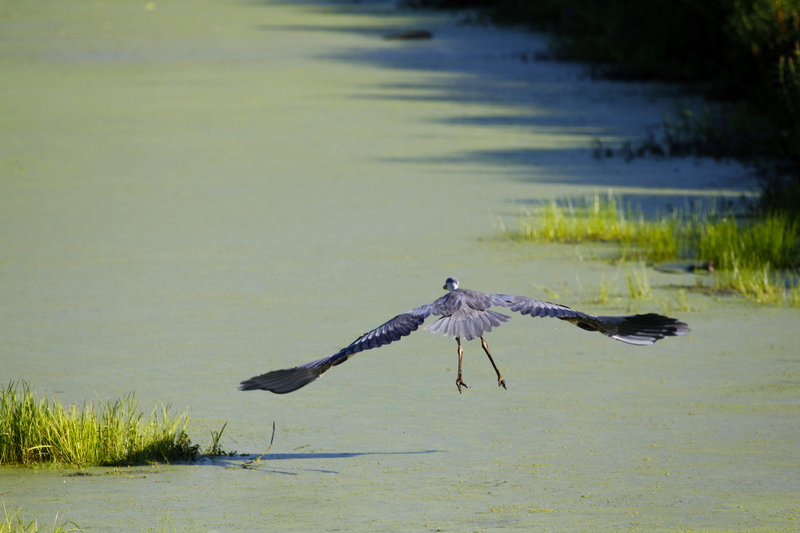 Great Blue Herons are numerous out at Wallkill River NWR. This one flew right in front of me. This Shot is SOOC, taken 7/25/13. Birds flying away usually don’t make for great photos, but I sort of like this one. GBHE out at Wallkill River NWR 7/25/13. I was with Karen Miller and Sharon Dewey Scavotto when we found this bird. We were all stumped, and after getting home and looking briefly in some books I’m guessing a young Brown-headed Cowbird, but I’m still not really sure. Please comment if you can I.D. this bird! Thanks. 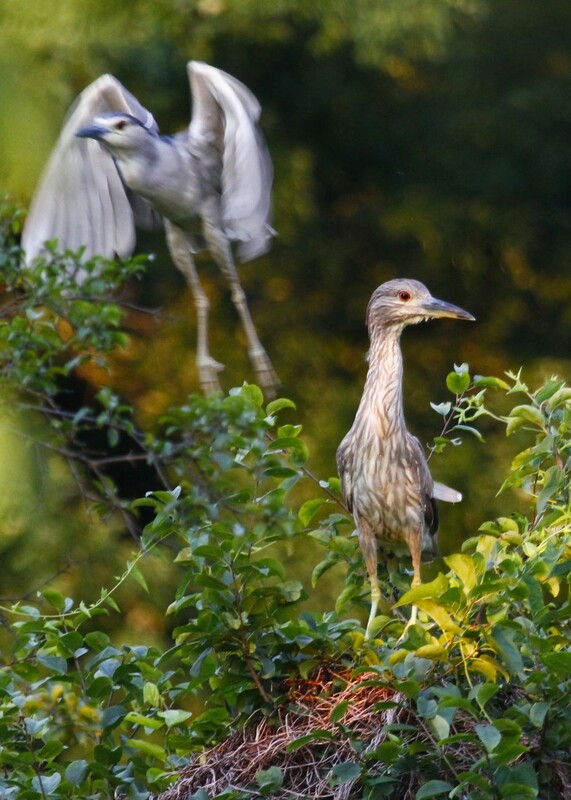 An adult just happened to fly behind this juvenile Black-crowned Night Herons out at Wallkill River NWR, 7/20/13. 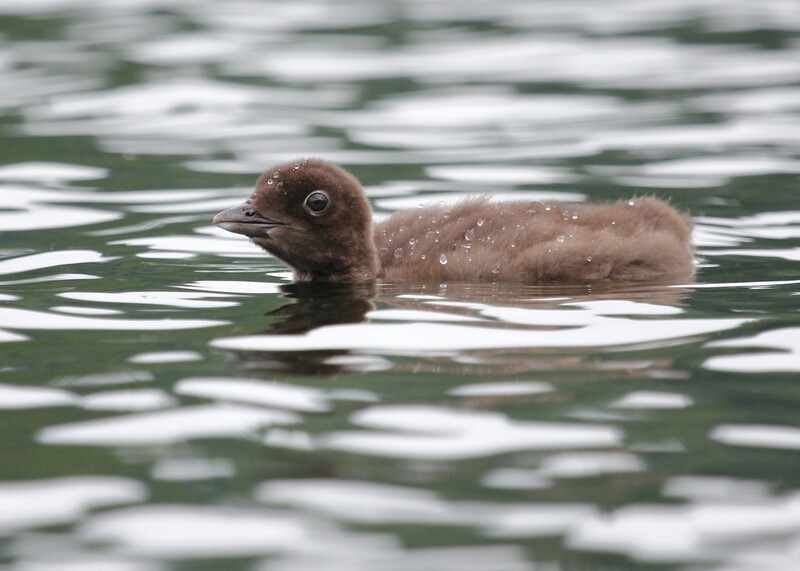 Although they are not a beautiful bird, I find the young BCNHs fascinating to look at. 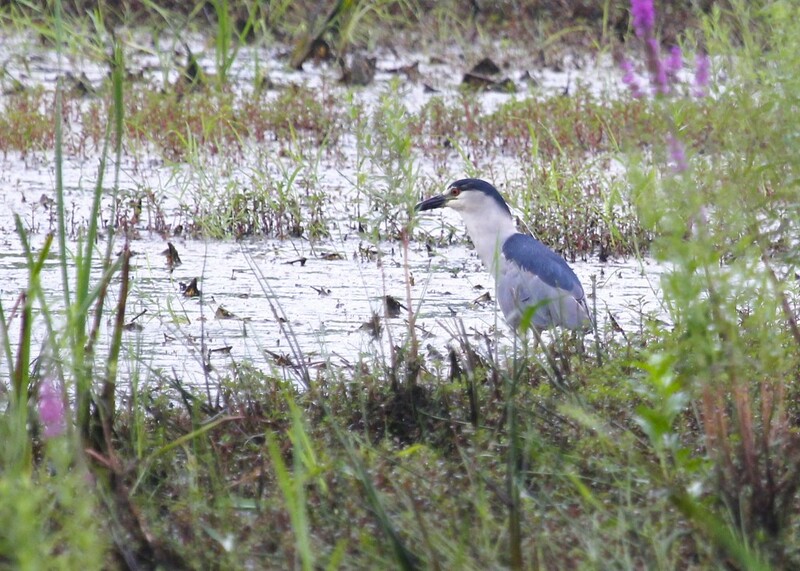 Adult Black-crowned Night Heron at Wallkill River NWR 7/20/13. 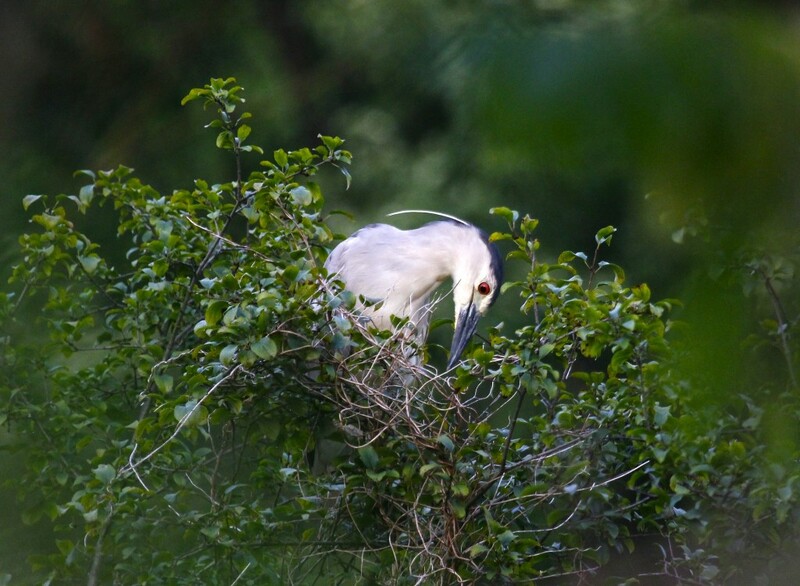 I see so many photos of BCNHs showing the white head plume – this is the first time I’ve gotten any showing it. I don’t love this photo, but I though it was cool to catch 3 BCNHs in one shot. Beyond the Black-crowned Night Herons, the birding was pretty good. Highlights included ten (!) 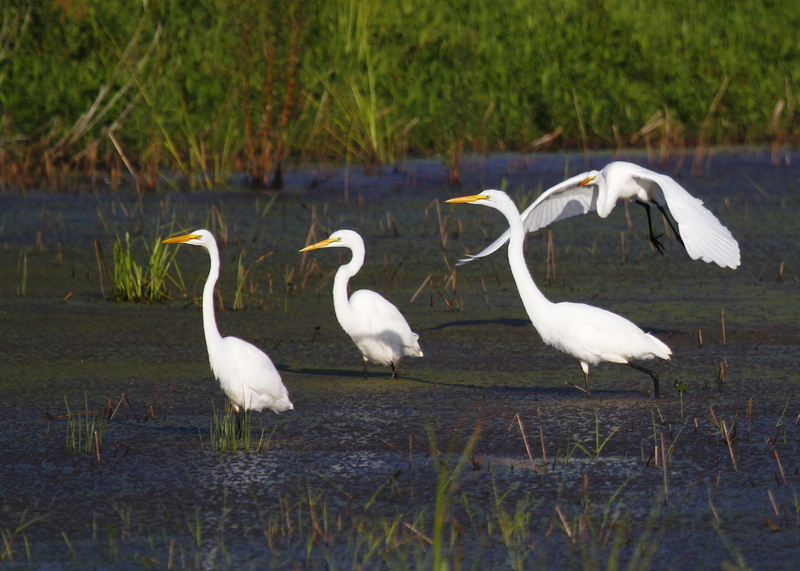 Great Egrets, my first Great Egrets at Wallkill River NWR this year. 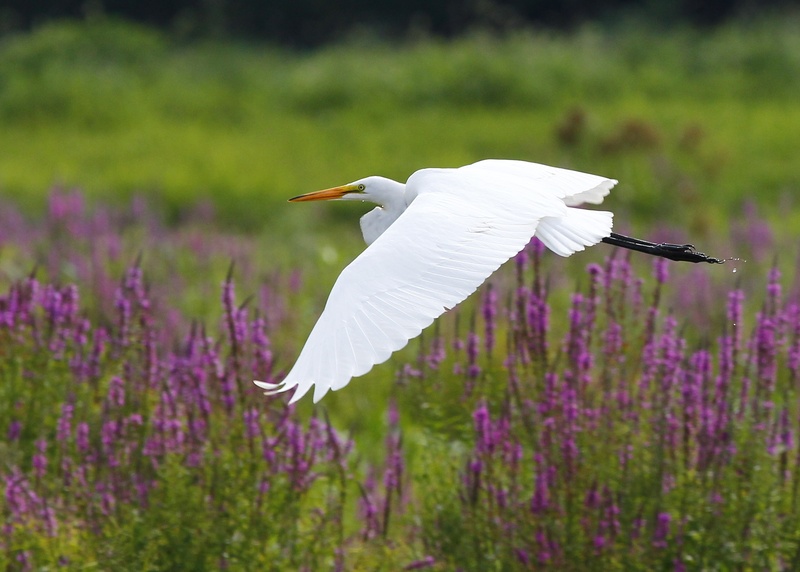 One of ten Great Egrets out at Wallkill River NWR, 7/20/13. Shorebirds made another good showing, I heard first and then saw three Greater Yellowlegs. 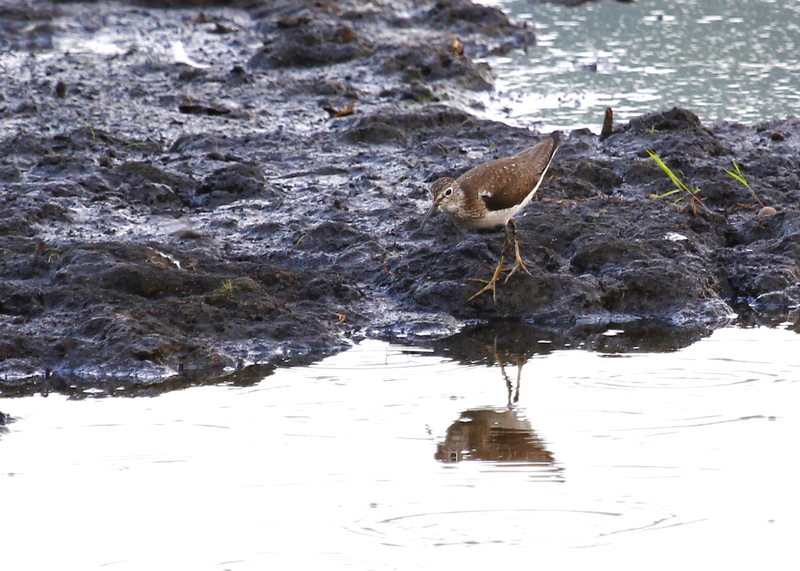 Also present were Killdeer, Spotted Sandpipers, Least Sandpipers, and this Solitary Sandpiper. 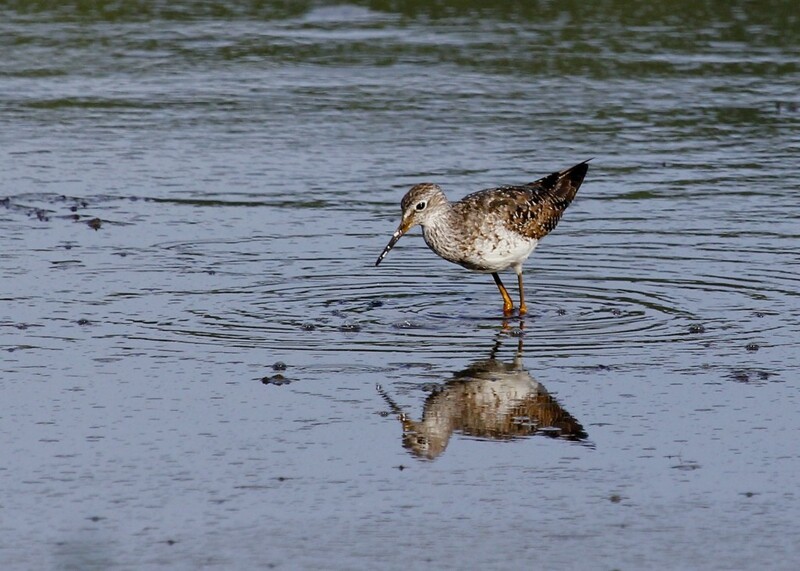 I have this as a Solitary Sandpiper, Wallkill River NWR 7/20/13. A pair of Red-tail Hawks perched on the north side of Oil City Road, 7/20/13. 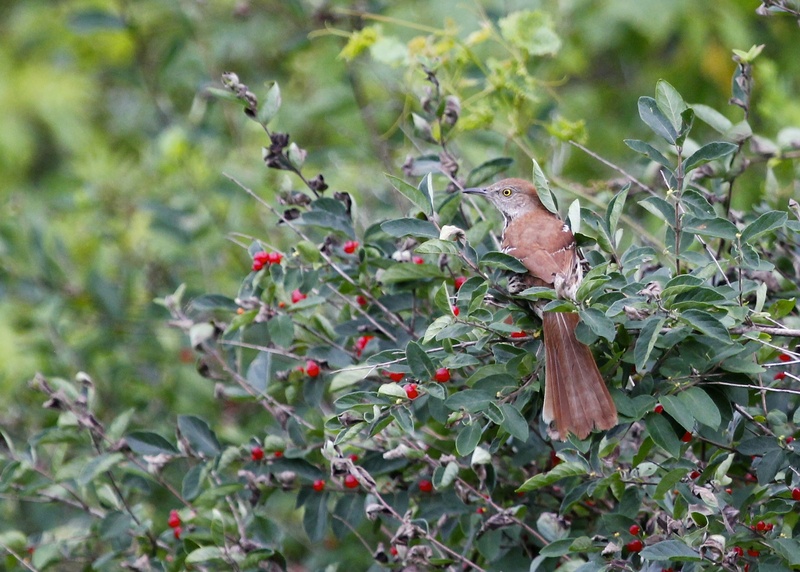 I took this shot of a Brown Thrasher a week ago out at the Shawangunk Grasslands. I didn’t really have much to say about that day, it was just a short visit, but I like this photo and wanted to post it. I have been hoping for a decent thrasher photo for a little while now, so I was excited when I saw a family of Brown Thrashers just off the entry road at the grasslands. They stayed mostly hidden, I have several obscured photos, but I did manage the above shot which was a bit distant but I still like it. 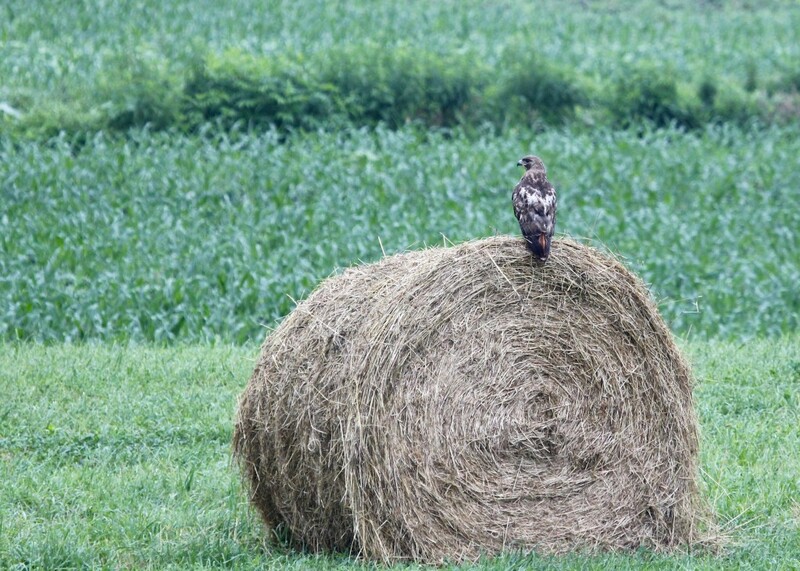 Red-tailed Hawk hunting from a hay bale on Pulaski Highway on my way out to Wallkill River NWR, 7/14/13. 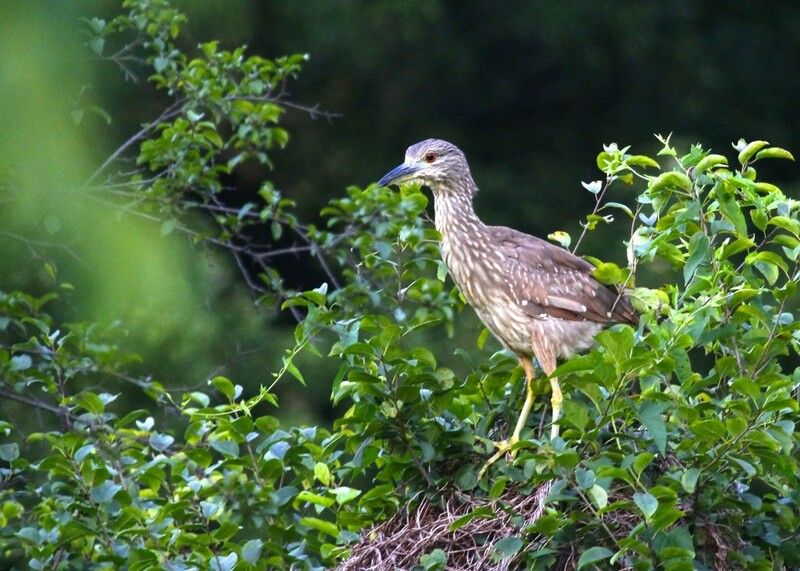 One of two Black-crowned Night Herons at Wallkill River NWR, 7/14/13. This one was in a small pool just to the left of the viewing platform. This BCNH flew in just as Karen Miller arrived. These birds were FOS for me. Another highlight was a nice collection of shorebirds located at the south end of the Liberty Loop. 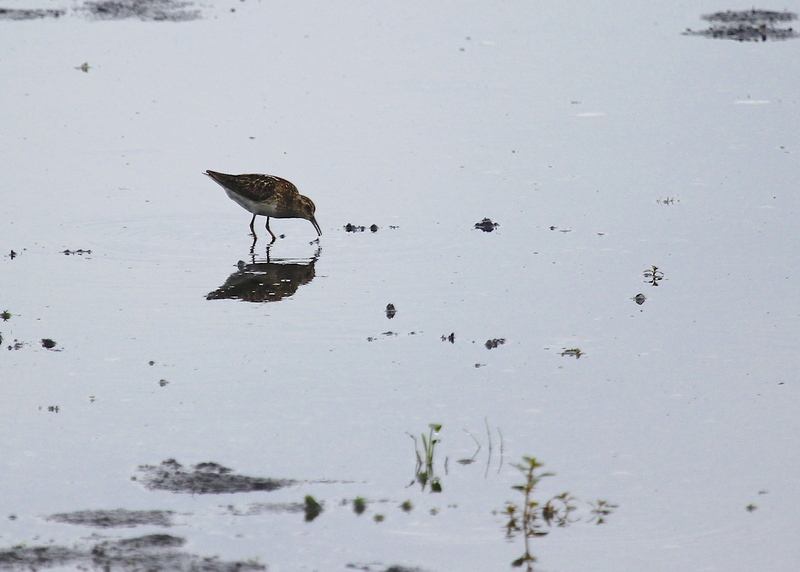 I’ll add my usual disclaimer that I am STILL struggling with shorebird identification, but I feel fairly confident that we had Spotted Sandpipers, Pectoral Sandpipers, Least Sandpipers, Killdeer, and a Solitary Sandpiper. A Killdeer along with a Spotted Sandpiper out at Wallkill River NWR 7/14/13. I have this as a Pectoral Sandpiper. Please leave a comment if you know otherwise! Thanks. 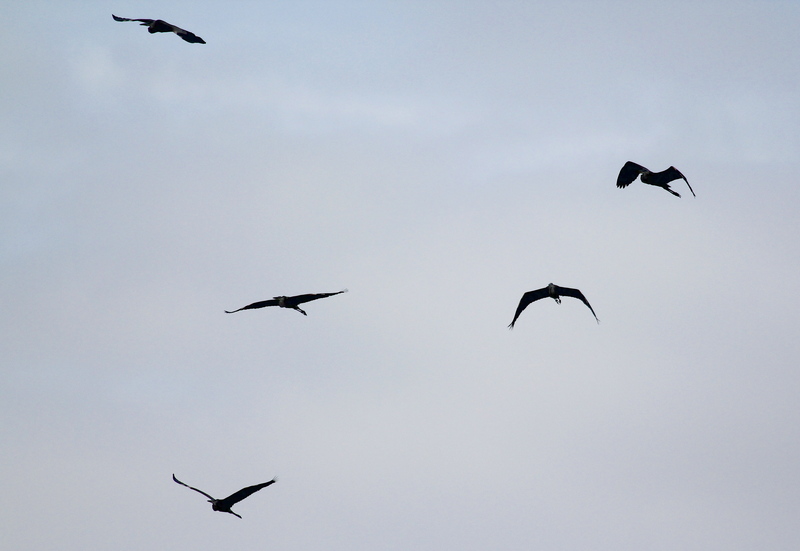 There were plenty of Great Blue Herons about, we even had 5 fly over at once. 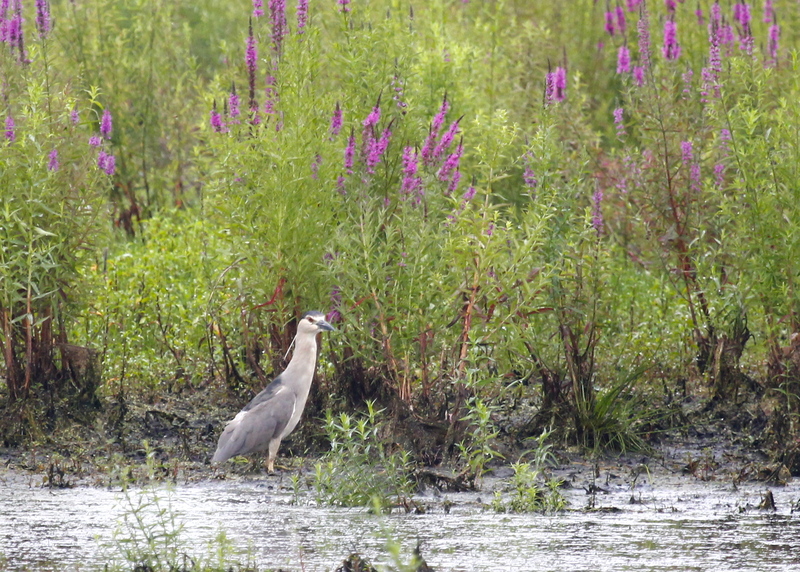 GBHE at Wallkill River NWR 7/14/13. This might be the same bird as seen on the hay bale at the top of this post. I took this shot on my way home and it was just across the road from where I took the hay bale shot. Late edit: I forgot to include Ruby-throated Hummingbird 1 to our species list. One of Tricia’s favorite sayings is “When in doubt, head north“, which is exactly what we did last weekend. Actually, I got the idea from John Haas after a recent discussion with him about being in a “birding slump”. His advice was to take a trip and spice things up a bit; he suggested the trip up north to Saranac Lake and gave me great tips on where to do the best birding. 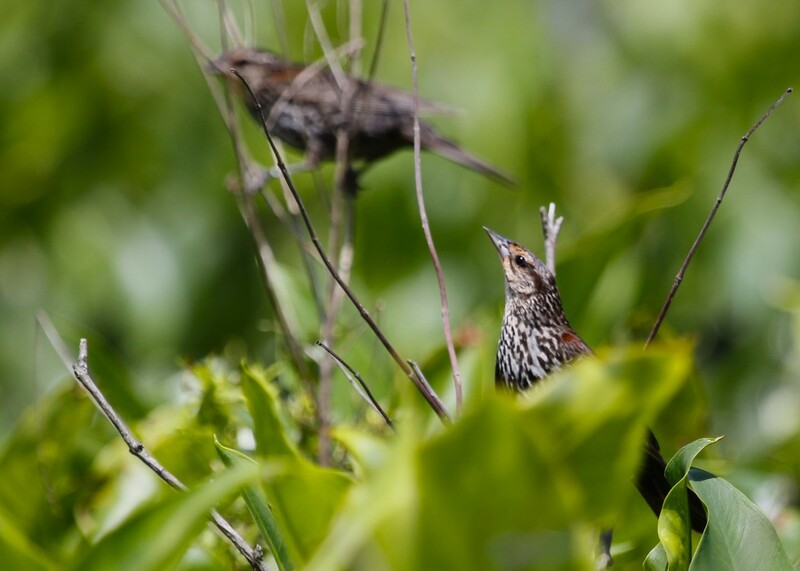 If anyone is interested in doing some birding in the Adirondacks, leave a comment and I will pass along as much information as I can. Tricia and I headed up on Friday after getting out of work a little bit early. 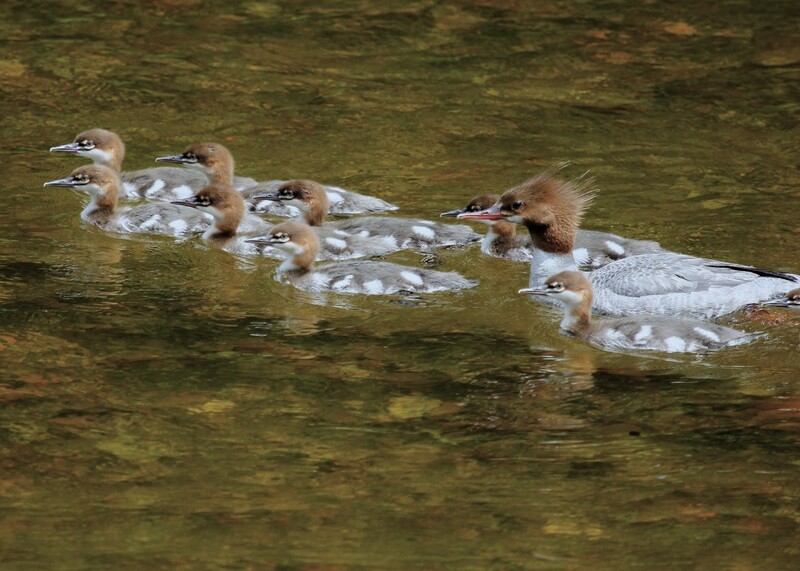 It was a pleasant drive that was highlighted by finding a female Common Merganser with her brood on the side of the road in Keene NY. I felt like this was a good omen for the weekend to come. Common Mergansers in Keene NY, 7/5/13. The color of the rocks below the surface and the late afternoon sun created an unusual and not necessarily pleasing effect, giving this photo and overall orange look. 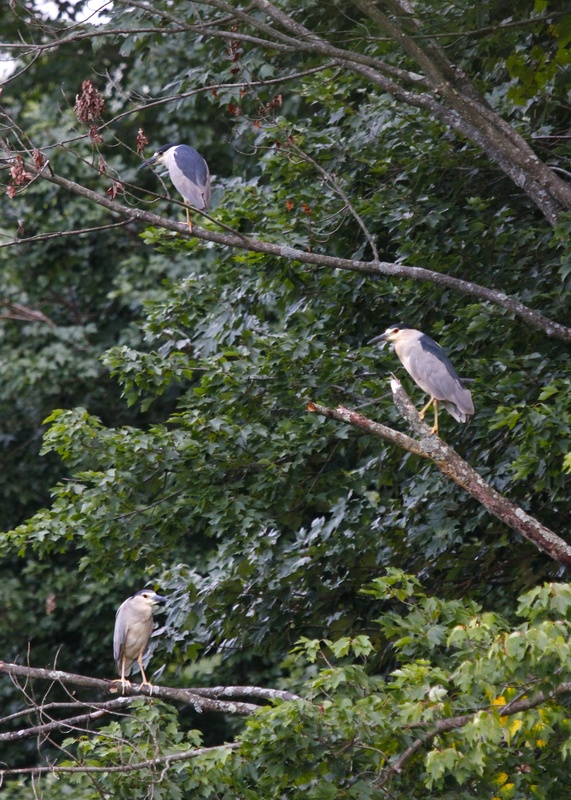 I made some adjustments to try to save it, but ultimately I am somewhat disappointed with all my shots of these birds. Friday evening we made a brief stop at Bloomingdale Bog Trail, near Bloomingdale Road. 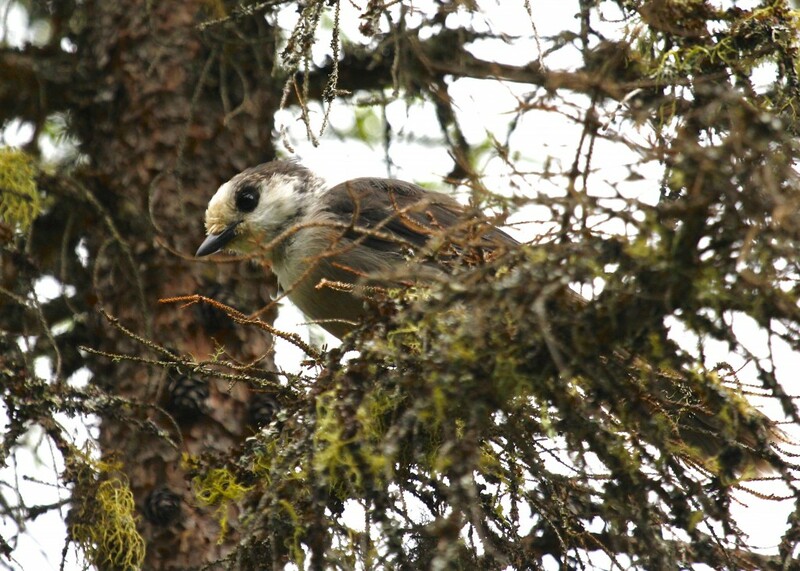 We were there for less than an hour when it started to rain pretty heavily, but before we ran for the car we managed to identify 14 species, including two life birds for me – a pair of Lincoln’s Sparrows and three Gray Jays. 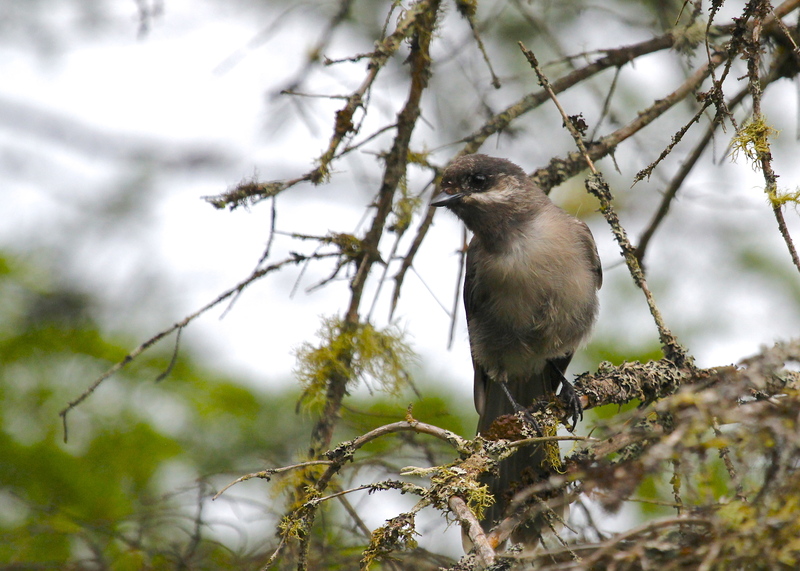 Adult Gray Jay at Bloomingdale Bog, 7/5/13. 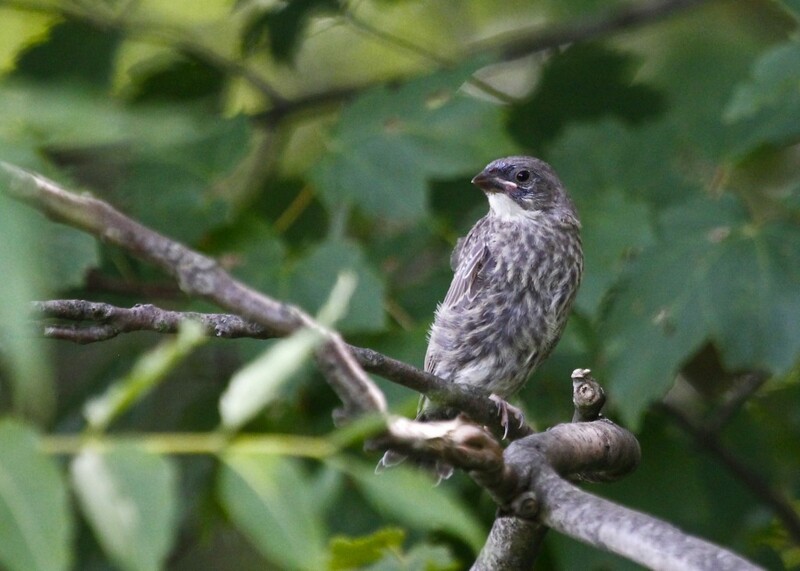 Juvenile Gray Jay at Bloomingdale Bog, 7/5/13. 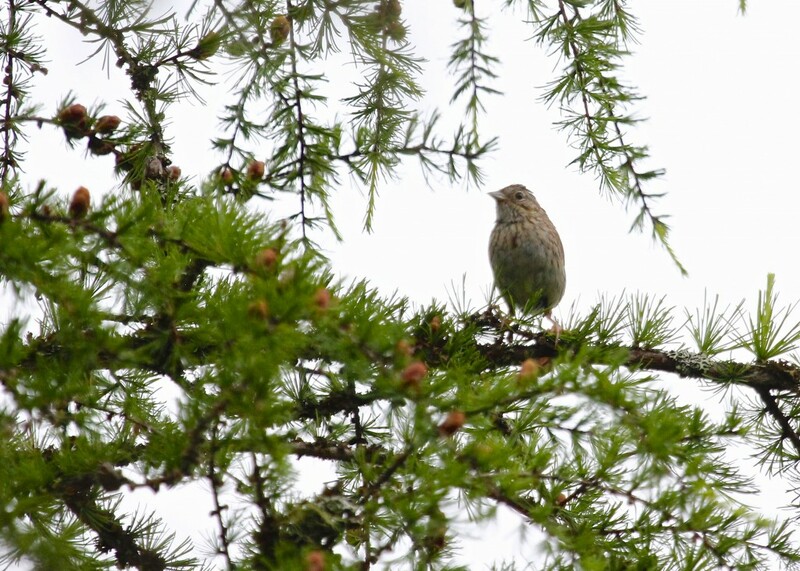 Lincoln’s Sparrow at Bloomingdale Bog, 7/5/13. 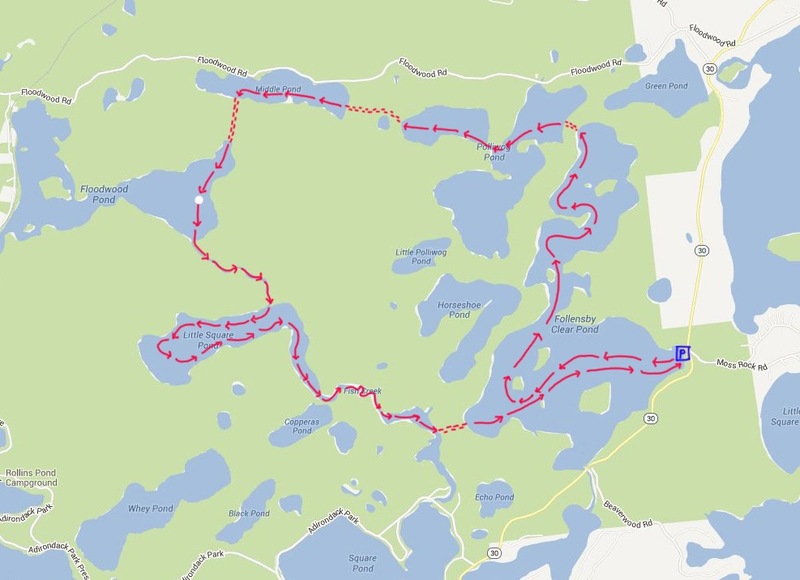 Our paddling route for the Fish Creek Loop. This was an adventure for me; up until now, I have just paddled locally in a single body of water for a couple of hours at a time. 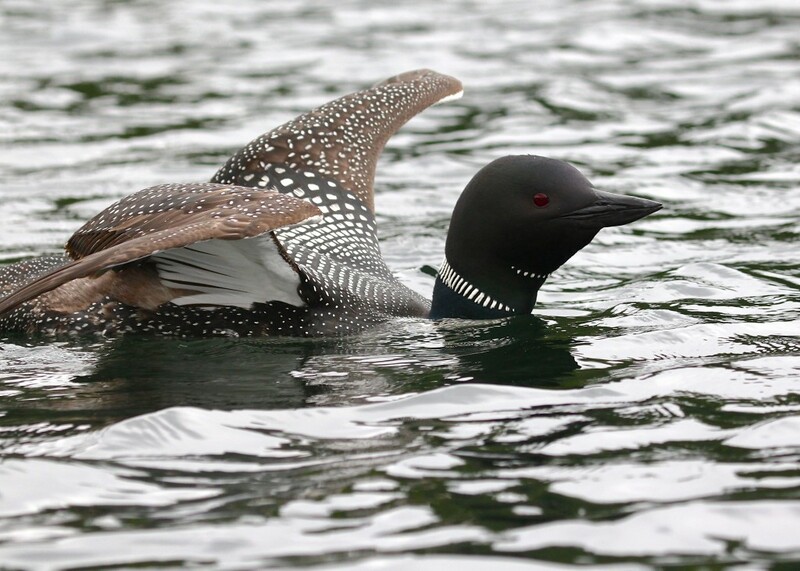 In ‘Quiet Water New York’, they mention seeing a Common Loon diving, so I was hoping that we might see one as well. We parked the car at the south end of Follensby Clear Pond. 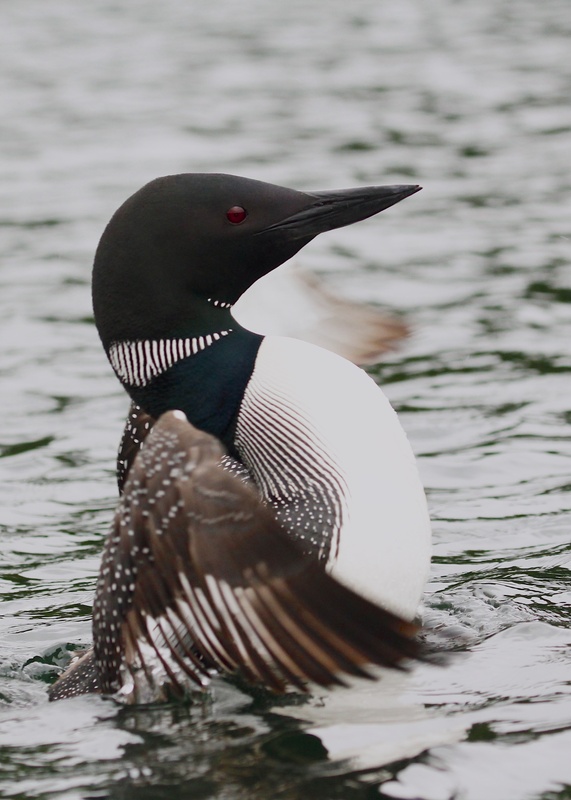 It was only moments after getting out of the car that Tricia noticed two Common Loons swimming in the distance. We put our kayaks in ASAP hoping to get close enough for a photo or two. We put in, and I was just floating in my kayak, trying to get situated and get my camera out of my dry bag. 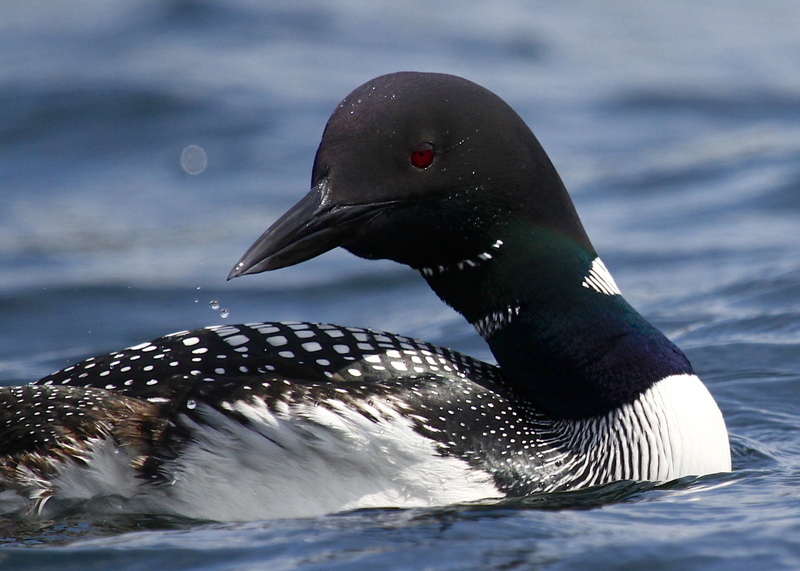 Tricia started calling my name urgently – a Common Loon had surfaced less than five feet from my kayak! This Common Loon Surfaced so close to me I had to wait to be able to take a photo! Follensby Clear Pond, 7/6/13. A very cute Common Loon chick in the north end of Follensby Clear Pond, 7/6/13. Common Loon at the north end of Follensby Clear Pond, 7/6/13. 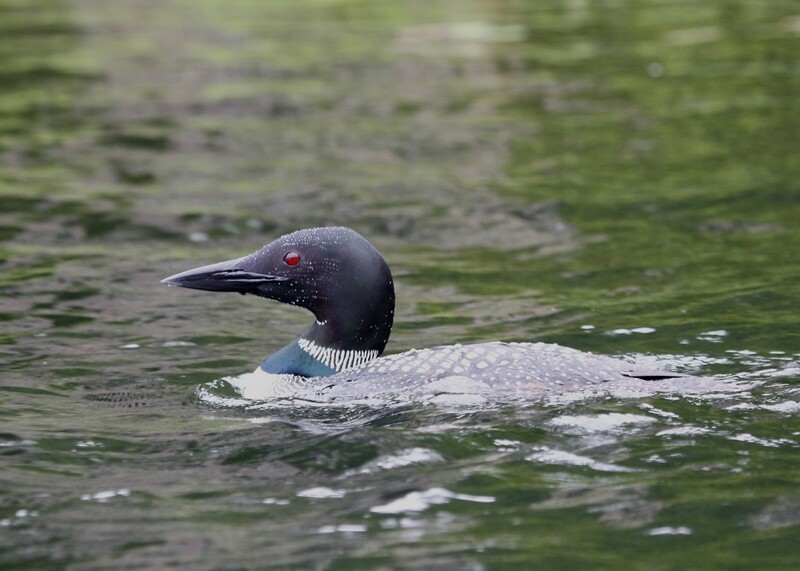 The loons were very active all around me – I was panicking trying to take photos! 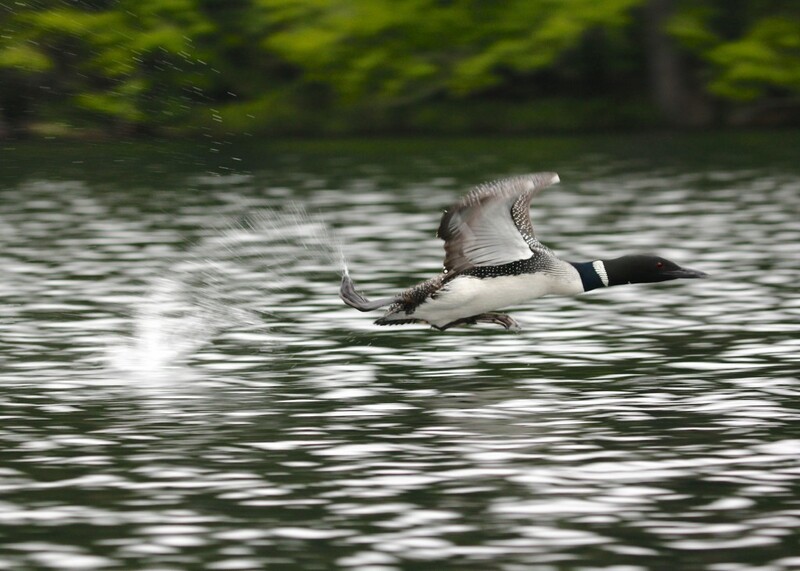 I was hoping to get a good shot of a loon flapping like this! 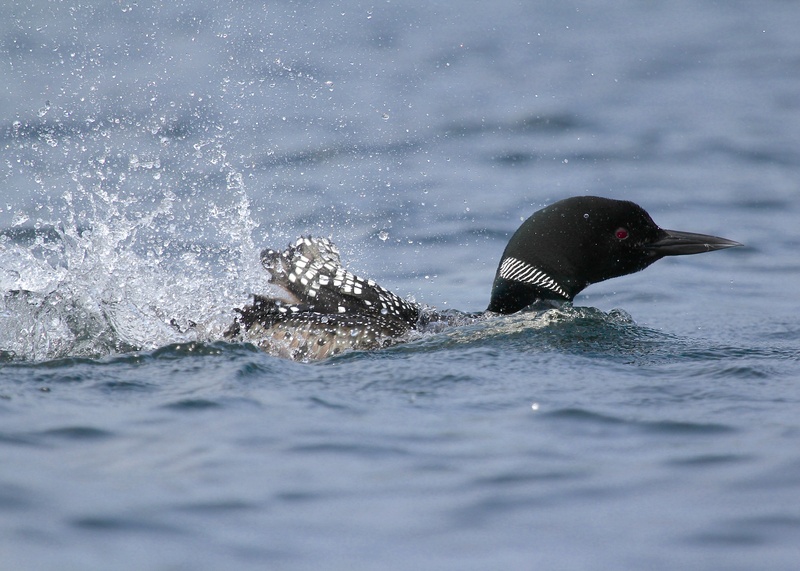 I guess loons are a heavy bird, so they require a long running, flapping take-off. Other birds seen on Follensby Clear Pond included: Common Merganser, Osprey, and Great Blue Heron. 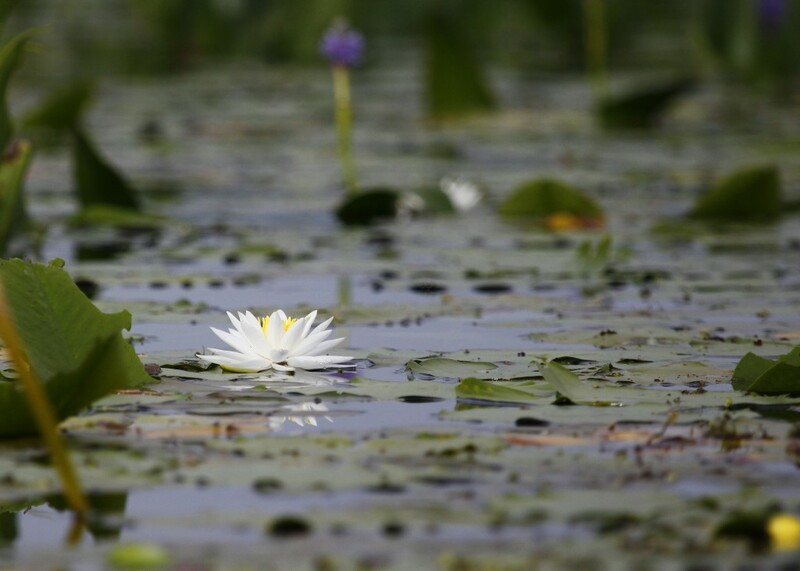 We found the carry to Polliwog Pond with the help of a local paddler who also happened to count Common Loons on the ponds for the Department of Environmental Conservation. These two chicks seem somehow conspiratorial. 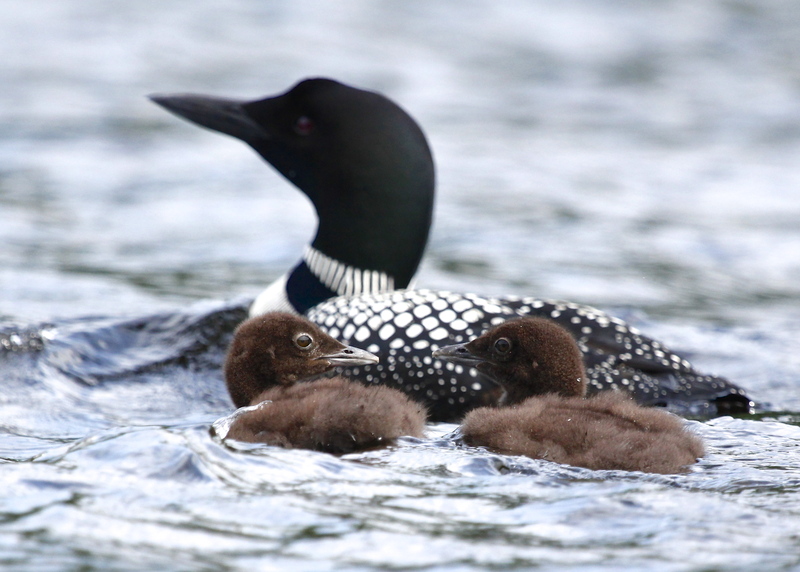 Common Loon with two chicks, Middle Pond 7/6/13. This is one of my favorite shots of the day. 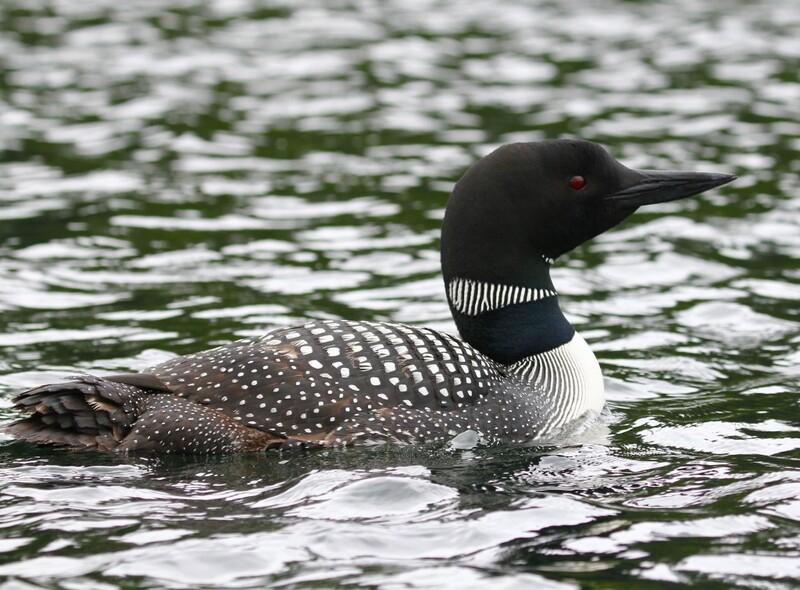 Common Loon at Follensby Clear Pond, 7/6/13. Common Loon splashing at Follensby Clear Pond, 7/6/13. It took us over seven hours and we were both exhausted. The final paddle to the where we parked the car was tough, it felt like we were paddling in quicksand. What a fantastic day! I cannot wait to do it again! In the evening, Tricia and I were both sure we would fall asleep if we didn’t get out and do something, so we decided to head over to Bigelow Road to do some birding. It was not very birdy, we were hearing some birds but not seeing any. We ran into three birders from the Syracuse area who were very nice. They were telling us that they hadn’t seen much either when Tricia said “I see a bird”. 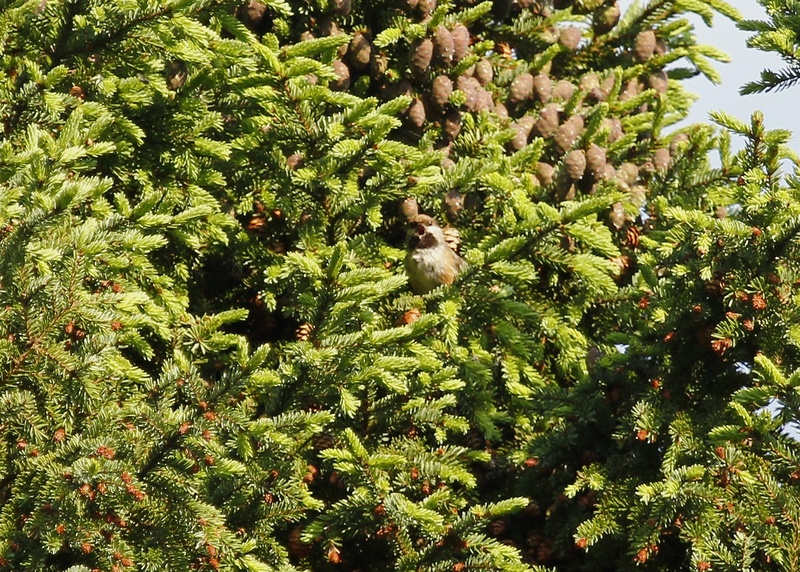 We looked in a tall evergreen and found a BOREAL CHICKADEE! The bird was a bit distant but managed to get some photos which ended up better than I expected. BOREAL CHICKADEE at Bigelow Road in Saranac Lake NY, 7/6/13. 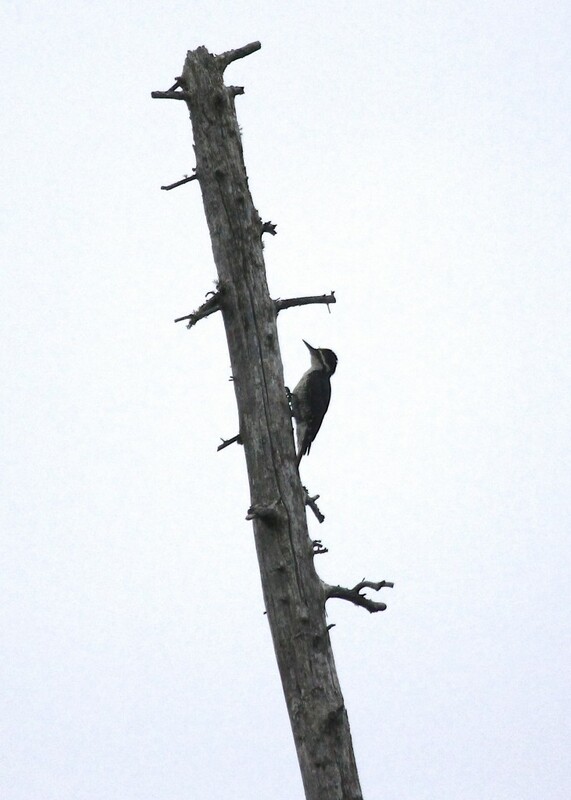 Black-backed Woodpecker at Bloomingdale Bog, 7/7/13. What a great weekend it was! Even sitting in hours of traffic to get home didn’t dampen our spirits after a fun, adventurous weekend like that. Author mattzeitPosted on July 10, 2013 Categories photos3 Comments on HEAD NORTH! 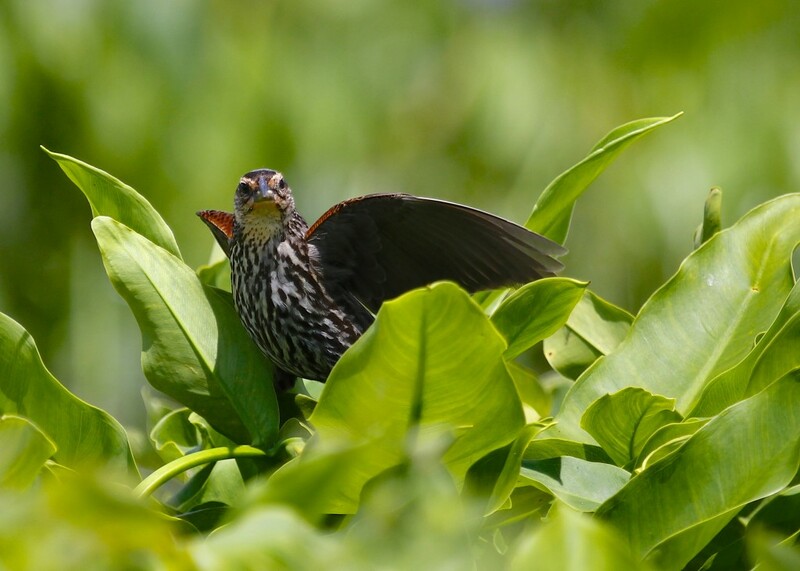 I love the pose this Red-winged Blackbird was taking – wings stretched out. Basha Kill WMA 7/4/13. I woke up early and took my kayak out to the Basha Kill for a paddle. Due to the heavy rains from earlier this week, the water level was really high, causing Haven Road to become flooded. The high water made an impact on my birding in a few ways. The first is that it made for a very easy paddle with no vegetation to slow me down in the channels. It also allowed me to explore the Bash outside the channels, where vegetation was present but it was still a relatively effortless paddle. Another effect of the high water level was also helpful. One of my target birds for the day was the Common Gallinule, which has been, for me, one of the tougher birds to get a good look at. Today I got several good looks and actually managed to get some decent photos. 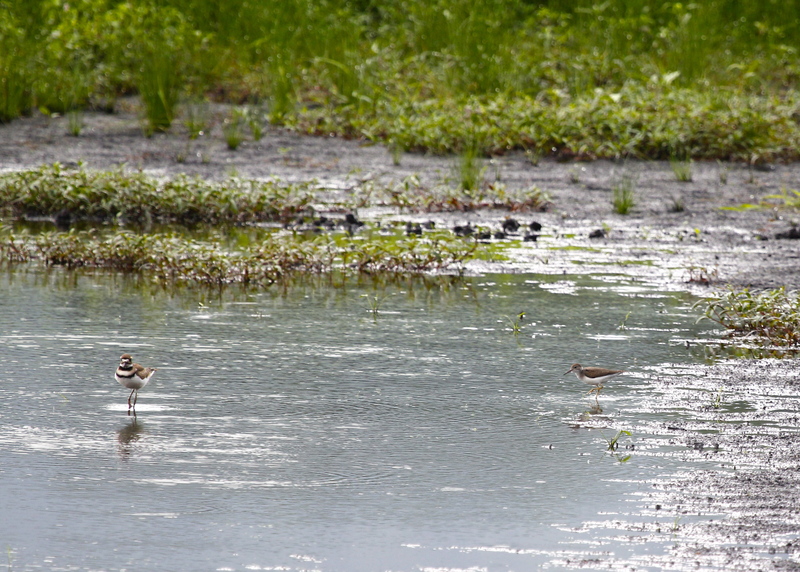 I believe that with the water up, there was less vegetation to hide these birds. Conversely, the final effect was not helpful at all. 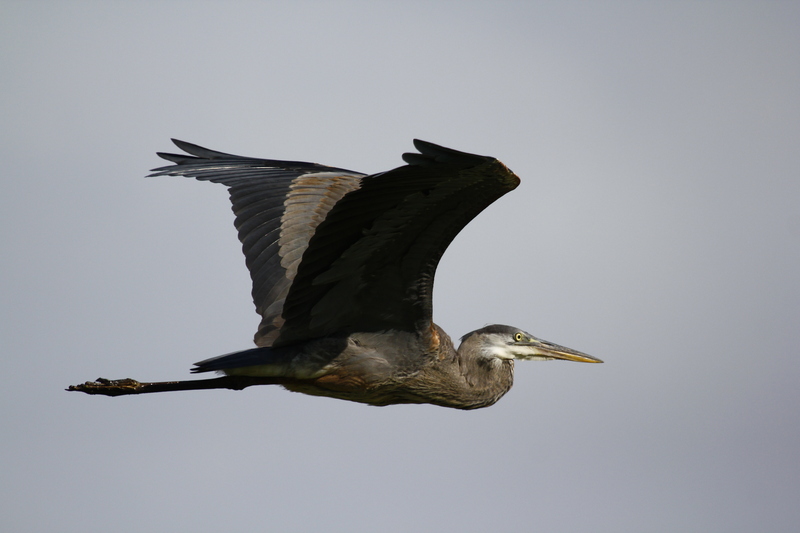 Great Blue Herons were out in numbers today, I saw probably 15 or so, but I never got close enough for a photo! Not one! I think that the GBHs were more easily aware of my presence without the vegetation to hide my approach. I heard this bird long before I saw it. 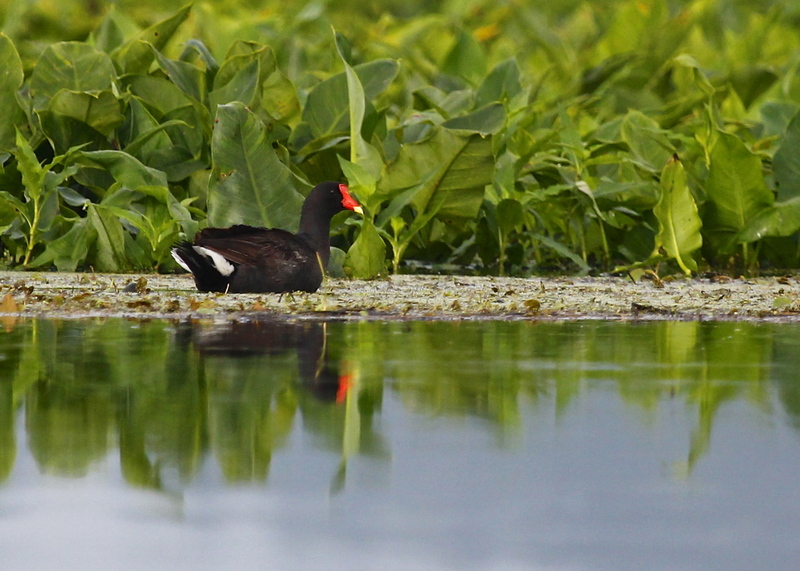 I am thrilled to finally get a decent shot of a Common Gallinule. Basha Kill 7/4/13. 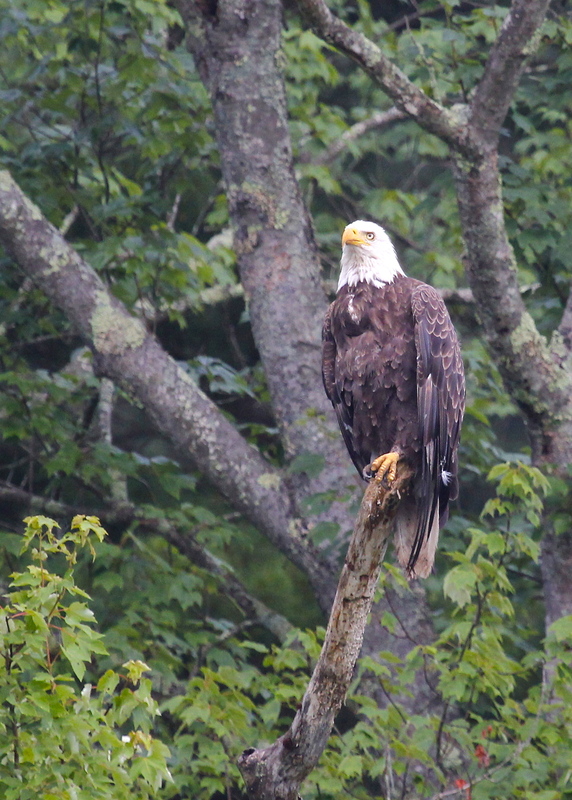 Adult Bald Eagle at Basha Kill WMA, 7/4/13. I had a close encounter with one of the adults bringing in food to the two fledges but I did not manage to get any photos as they flew right over me in my kayak. One more shot of the many Red-winged Blackbirds out at the Basha Kill, 74/13. I’m trying to branch out a bit, taking photos of things other than birds. Basha Kill, 7/4/13.